Redefining Banking For Women. Because It's Smart Business. 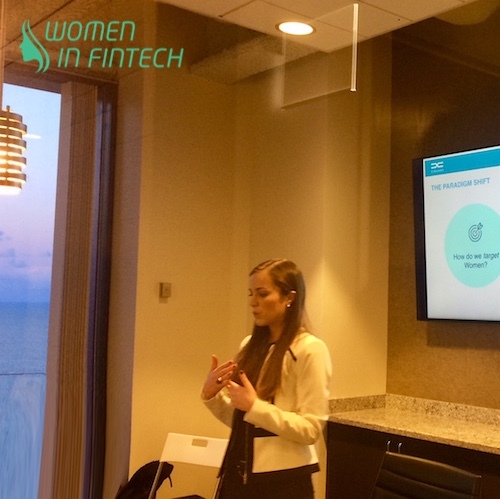 Last month, I was invited to speak at an event called Women In FinTech Initiative (WIFI), a conference held at FinTank - Chicago’s FinTech Hub - to provide visibility, community, and resources for women in the financial technology industry. As you can imagine, with a room full of female attendees, there was much debate with many engaging conversations on how to be successful when designing solutions with them in mind and how to better drive inclusion for the 51% of the planet; women. - Women represent just 29% of staff in the sector, according to a study done by EY in London. - Research by The International Monetary Fund points out that only 2% of bank CEOs are women. - A recent analysis of global patents suggests that only 15% of patents involve a woman inventor, and significantly less in IT. So, what can we do to change this bleak picture? Kimberly H. Wolfson, Chairwoman of FinTank's WIFI, opened a discussion that covered both better provision of financial services to women and better representation of women in industries that provide financial services—with the clear understanding that the topics are linked. Take all the potential customers in your industry, with all the estimated ROI, and cut those numbers in half. Then, leave all profits on the table for your competitors to grab. This is what many banks are missing out on by failing to connect with women: all this despite making 80% of all purchasing decisions and holding 52% of current bank accounts. While it’s no secret that women are increasingly occupying leadership positions, the banking industry has yet to pay them the attention they deserve. The good news is that there’s an amazing opportunity to do just that, and do it right - by shifting the question from: “How can we target women” to “How can we serve women better”. Nicole M. Kalajian, attorney at Stradley Ronon, represents securities and commodities professionals in a variety of complex regulatory, compliance and corporate matters, and she knows a thing or two about crafting a fulfilling career in the investment landscape. “As I see it, success for professional women in male-dominated industries such as banking, investing, or technology, will no longer be about trying to compete at the men’s version of the game”, she points out. Nicole believes there are many reasons to be optimistic about the future. The business world is changing fast –driven largely by technology - and is changing in ways that give us more power and opportunities than ever.